Before You Buy: We offer building plans (instructions) how to build shed on the picture only, the material to build it purchased separately. If you have any question ask first before you buy. Total Sq. Ft : 80 sq. ft. Doors : 64" x 71"
A quality set of plans come with every detail you need to complete your project with a limited amount of time, money and tools for any level skill of builders. Build our shed not only save you money, it enhances the value of your property as well, while solving many storage challenges. 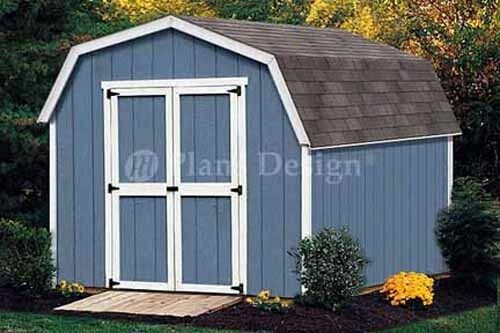 We are offer plans how to build shed exactly on the picture, shown actual sample with %100 money back guarantee. If for any reason you are not satisfied, they may be returned for refund according to our return policy. If you have any questions concert about our plans, email us, we’ll be happy to clarify, explain or correction them if needed at no additional cost. These samples are chosen at random from actual plans to show construction guide illustrations look like. To avoid the mistake of buying crude incomplete or difficult to understand plans, we strongly recommend you to view the sample first before you make any purchase a set of shed plans in eBay. Q: Why do I buy one set of plans if I can buy 100 plans or more in CD for one price? A: Most of plans in CD are incomplete. Our plans are high quality plans, showing in great detail. Q: Do you offer download plans? A: No. Our plans are on paper, generated directly from Auto-Cad drawings.